April 14, 2019, 5:13 PM · AMSTERDAM - Muziekgebouw aan’t IJ, Amsterdam’s 15-year-old architectural gem perched picturesquely on the capital’s harbor, is a wonderful foil to Alice Tully Hall, the glass-enclosed home to the Chamber Music Society of Lincoln Center (CMS). Conceived as a meeting of musical minds and hearts in 1969, CMS has been committed to expanding the chamber music repertoire while offering exuberant performances of masterpieces at its Manhattan home for decades. Under such inspirational leadership as the intellectual wizard Charles Wadsworth and the dynamic cello-piano duo, David Finckel and Wu Han, the CMS has expanded its offerings to include tours to Asia and Europe. And, in the late 1990s the CMS spawned a program (the Bowers Program) to enable stellar starters in chamber music the chance to gain experience while growing their careers. 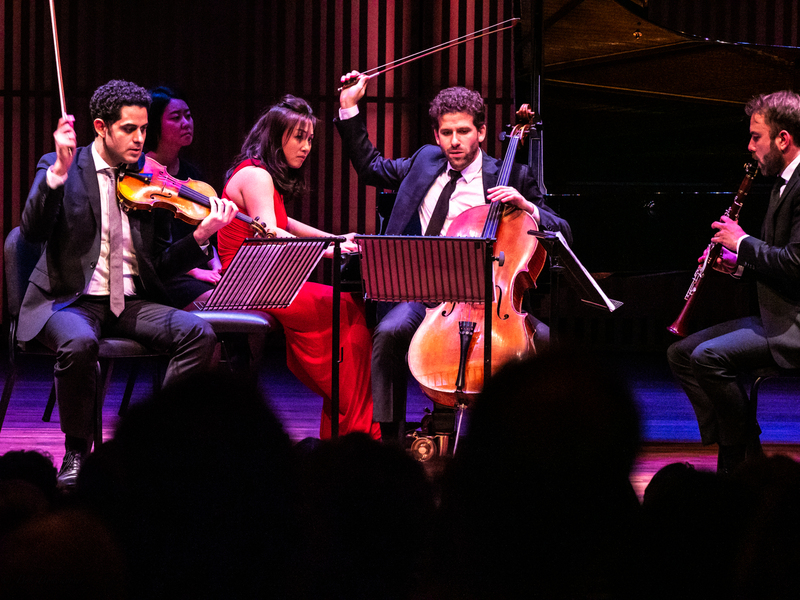 Four extraordinary beneficiaries of the program, violinist Arnaud Sussmann, violist (on this occasion) Yura Lee who was a Bowers violin fellow, cellist Nicolas Canellakis, clarinetist Tommaso Lonquich and pianist Wu Qian joined forces in a weekend concert that Amsterdam audiences will certainly not forget in the foreseeable future. 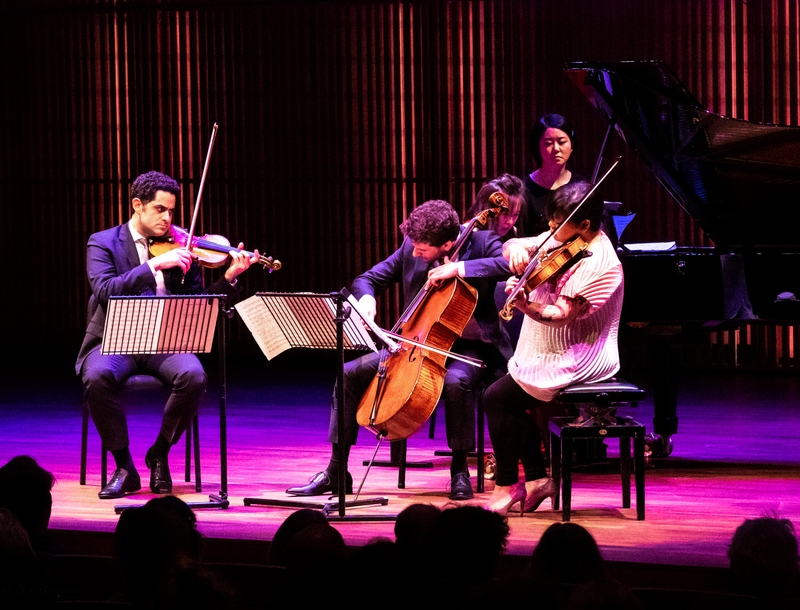 True to its devotion to presenting ‘something old and something new’ the CMS stars gave credence to a glorious centerpiece, the Amsterdam unveiling of Brett Dean’s Seven Signals for Clarinet, Violin, Cello and Piano. Billed as ‘Three Centuries’, or in Dutch ‘A romp through music history’, the program enlarged the horizon by surrounding Dean’s minimalist magic with music that was inspirational to the versatile Australian composer and former Berlin Philharmonic violist. Chronologically, the first work presented was the first composed. The most infrequently performed of Beethoven’s opus 9 string trios; trio no. 2 is erroneously dismissed as a youthful work of little consequence. With discernment and great panache, Sussman, Canellakis and Lee united in subtlety and strength. Delicate articulation and the savvy to adjust to harmonic tension characterized an interpretation of compelling authenticity and warmth. Yura Lee, an international prizewinner as both violist and violinist projected phrases of indescribable pathos in the delicately wrought slow movement. Moving forward in time to Debussy’s enchanting Première rapsodie composed to showcase Paris Conservatoire clarinet exam candidates in the early years of the 20th century was given a synergetic reading replete with a full impressionistic panoply of light and shadow showing off the prodigious talents of clarinetist Tommaso Lonquich and pianist Wu Qian. Scored for clarinet violin, cello and piano, Dean’s most recent masterpiece sets out to challenge contemporary listeners. Seven transitory, short movements expose the ups and downs of listeners in the 21st century whose attention spans have been attenuated by overexposure to all sorts of stimuli. The composer opens a musical window on a sound cosmos in which nonverbal communication beckons in contrast to the interminable verbiage or more appropriately blah blah that dominates media social and otherwise. Dean recreates a sound world in which distress signals at sea, SOS Morse code and scratched texts on prison cell walls transition into a musical modus. Following the initiation entitled “Impulse Study,” in which diffuse sounds move rapidly into a mesmerizing rock out, the “Beacon” movement swayed with impressionistic light amid tendrils of fog. The superlative CMS quartet of players proved that there is plenty of beauty in the gentle swaying sea of sound evoking Benjamin Britten at his best. Throughout the performance all four performers were every bit as riveting as the intense score. Music and movement joined in mad irregularity during the “Semaphore” movement in which bizarre rhythmic patters were punctuated by bow whips on the part of the violinist and cellist. Several audience members whispered, ‘Harry Potter’s magic wand’ has come to life as sounds whirled through the mesmerized hall. In the terrifying “Tallying” movement repeated quarter notes pass through the group to represent the monotony of incarceration, A ticking clock of pizzicato and slow moving quarter syncopations spell out the passage of time in pianissimo desperation with clarinet filigrees descending to nothingness. Evocative of eccentric Charles Ives quizzical scores, the closing movement, “Morse 2,” escorts the listener to the sinking Titanic. The inner workings of the piano were tapped in a last minute distress signal as the remainder of the players phrased fragments of “Nearer My God to Thee” in eerie pianissimo. In Dean’s world there is no God to save us from the bitterness of the end. The stand-alone composition in the second half, Brahms’s magnificent piano quartet in g minor, Op. 25 was given an incredible performance. With just a bit of imagination the listener was transported to work’s first performance when Clara Schumann performed her magic. Moving with ease from emotional depth to the pizzazz of the gypsy spectacle finale this was a hallelujah performance in which every note mattered, every phrase was celebrated with increasing intensity. The CMS artists’ exuberant music making never came at the cost of sensitivity and impeccable turns of phrase and every tempo change was wrought with care. The only sour note was the absence of music students in the hall: such a celebration should be shared with all! Make way for CMS, hopefully coming to your neighborhood sometime soon.